Identify and discuss common vision defects. Explain nearsightedness and farsightedness corrections. The need for some type of vision correction is very common. Common vision defects are easy to understand, and some are simple to correct. 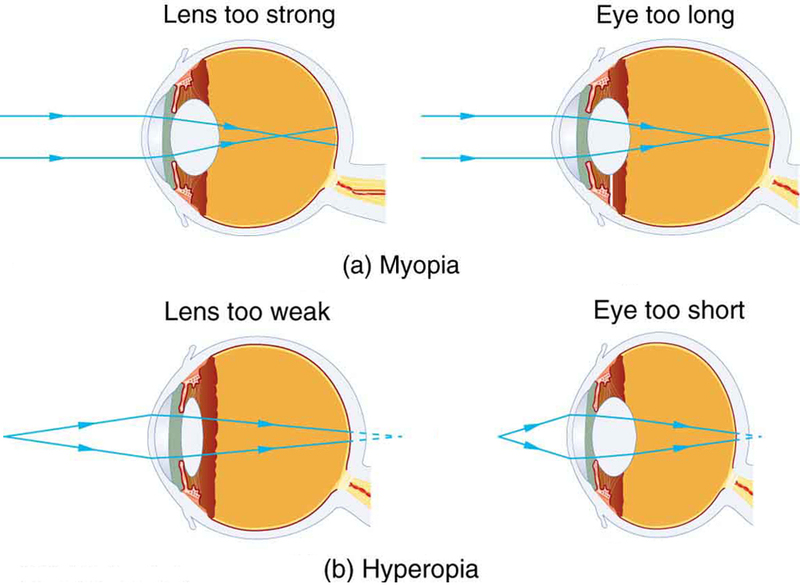 Figure 1 illustrates two common vision defects. Nearsightedness, or myopia, is the inability to see distant objects clearly while close objects are clear. The eye overconverges the nearly parallel rays from a distant object, and the rays cross in front of the retina. More divergent rays from a close object are converged on the retina for a clear image. The distance to the farthest object that can be seen clearly is called the far point of the eye (normally infinity). Farsightedness, or hyperopia, is the inability to see close objects clearly while distant objects may be clear. A farsighted eye does not converge sufficient rays from a close object to make the rays meet on the retina. Less diverging rays from a distant object can be converged for a clear image. The distance to the closest object that can be seen clearly is called the near point of the eye (normally 25 cm). Figure 1. (a) The nearsighted (myopic) eye converges rays from a distant object in front of the retina; thus, they are diverging when they strike the retina, producing a blurry image. This can be caused by the lens of the eye being too powerful or the length of the eye being too great. (b) The farsighted (hyperopic) eye is unable to converge the rays from a close object by the time they strike the retina, producing blurry close vision. This can be caused by insufficient power in the lens or by the eye being too short. Since the nearsighted eye over converges light rays, the correction for nearsightedness is to place a diverging spectacle lens in front of the eye. This reduces the power of an eye that is too powerful. Another way of thinking about this is that a diverging spectacle lens produces a case 3 image, which is closer to the eye than the object (see Figure 2). To determine the spectacle power needed for correction, you must know the person’s far point—that is, you must know the greatest distance at which the person can see clearly. Then the image produced by a spectacle lens must be at this distance or closer for the nearsighted person to be able to see it clearly. It is worth noting that wearing glasses does not change the eye in any way. The eyeglass lens is simply used to create an image of the object at a distance where the nearsighted person can see it clearly. Whereas someone not wearing glasses can see clearly objects that fall between their near point and their far point, someone wearing glasses can see images that fall between their near point and their far point. Figure 2. Correction of nearsightedness requires a diverging lens that compensates for the overconvergence by the eye. The diverging lens produces an image closer to the eye than the object, so that the nearsighted person can see it clearly. What power of spectacle lens is needed to correct the vision of a nearsighted person whose far point is 30.0 cm? Assume the spectacle (corrective) lens is held 1.50 cm away from the eye by eyeglass frames. You want this nearsighted person to be able to see very distant objects clearly. That means the spectacle lens must produce an image 30.0 cm from the eye for an object very far away. An image 30.0 cm from the eye will be 28.5 cm to the left of the spectacle lens (see Figure 2). Therefore, we must get when . The image distance is negative, because it is on the same side of the spectacle as the object. The negative power indicates a diverging (or concave) lens, as expected. The spectacle produces a case 3 image closer to the eye, where the person can see it. If you examine eyeglasses for nearsighted people, you will find the lenses are thinnest in the center. Additionally, if you examine a prescription for eyeglasses for nearsighted people, you will find that the prescribed power is negative and given in units of diopters. Since the farsighted eye under converges light rays, the correction for farsightedness is to place a converging spectacle lens in front of the eye. This increases the power of an eye that is too weak. Another way of thinking about this is that a converging spectacle lens produces a case 2 image, which is farther from the eye than the object (see Figure 3). To determine the spectacle power needed for correction, you must know the person’s near point—that is, you must know the smallest distance at which the person can see clearly. Then the image produced by a spectacle lens must be at this distance or farther for the farsighted person to be able to see it clearly. Figure 3. Correction of farsightedness uses a converging lens that compensates for the under convergence by the eye. The converging lens produces an image farther from the eye than the object, so that the farsighted person can see it clearly. What power of spectacle lens is needed to allow a farsighted person, whose near point is 1.00 m, to see an object clearly that is 25.0 cm away? Assume the spectacle (corrective) lens is held 1.50 cm away from the eye by eyeglass frames. 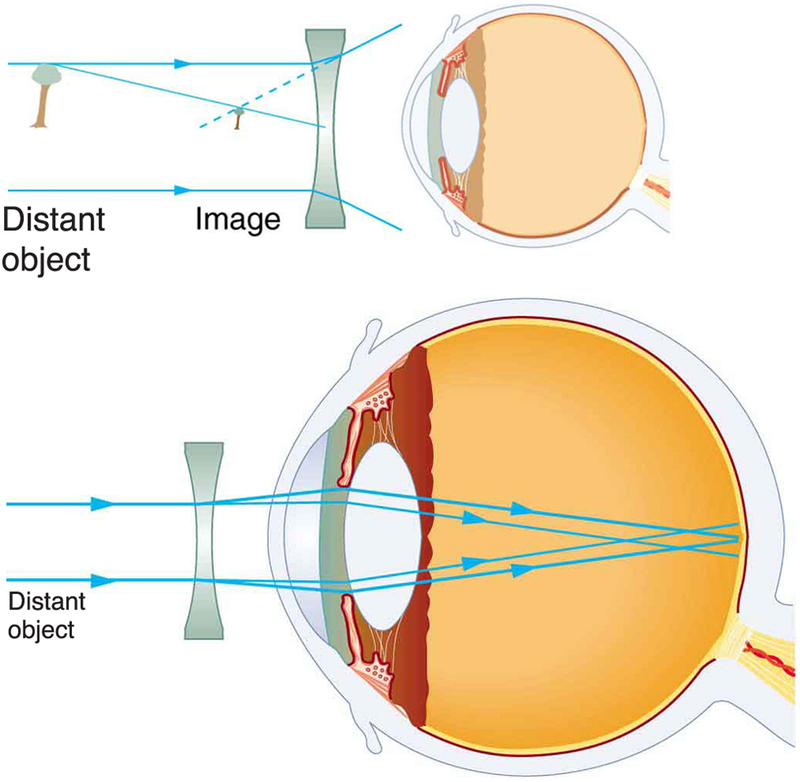 When an object is held 25.0 cm from the person’s eyes, the spectacle lens must produce an image 1.00 m away (the near point). 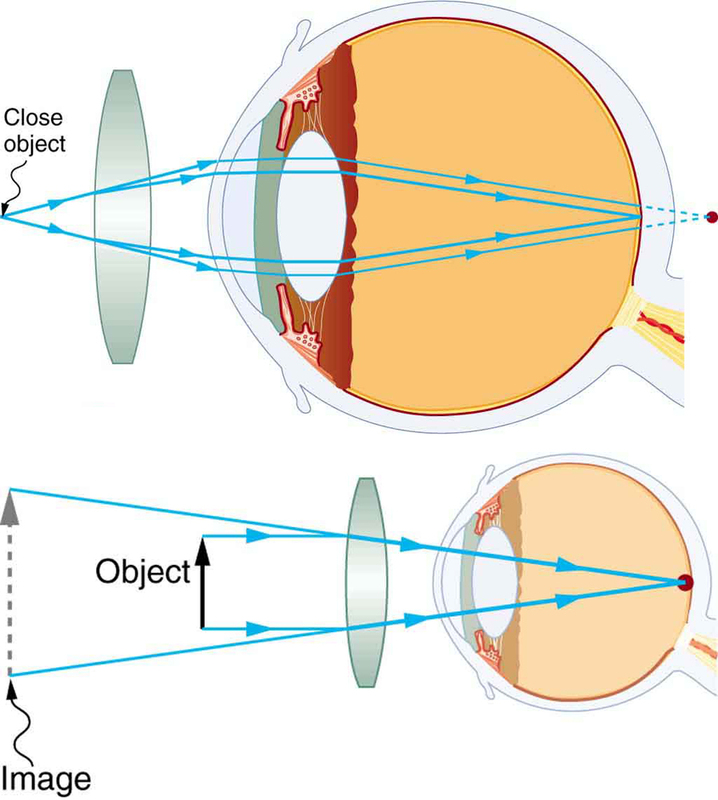 An image 1.00 m from the eye will be 98.5 cm to the left of the spectacle lens because the spectacle lens is 1.50 cm from the eye (see Figure 3). Therefore, . The image distance is negative, because it is on the same side of the spectacle as the object. The object is 23.5 cm to the left of the spectacle, so that . 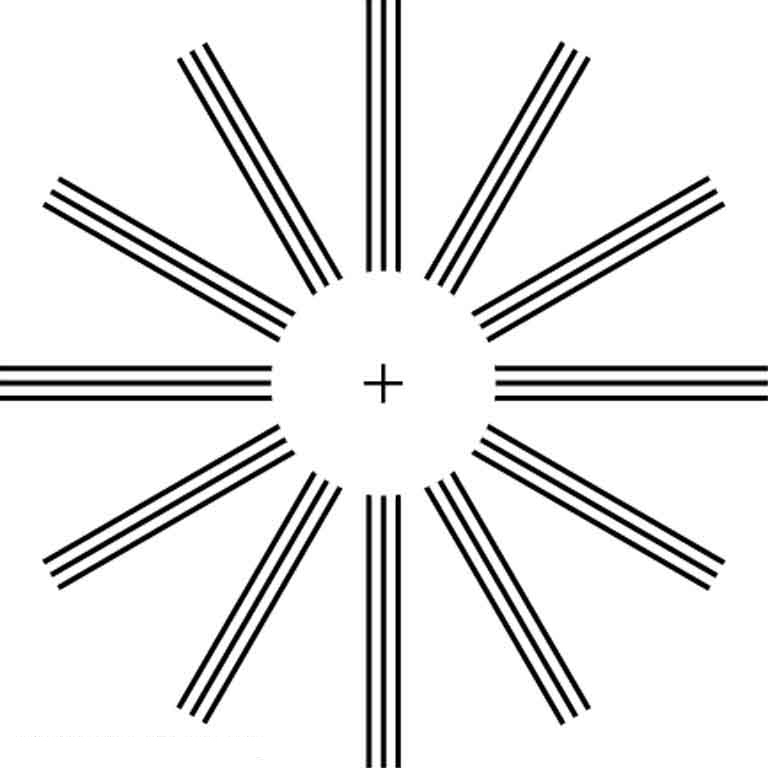 The positive power indicates a converging (convex) lens, as expected. The convex spectacle produces a case 2 image farther from the eye, where the person can see it. If you examine eyeglasses of farsighted people, you will find the lenses to be thickest in the center. In addition, a prescription of eyeglasses for farsighted people has a prescribed power that is positive. Another common vision defect is astigmatism, an unevenness or asymmetry in the focus of the eye. For example, rays passing through a vertical region of the eye may focus closer than rays passing through a horizontal region, resulting in the image appearing elongated. This is mostly due to irregularities in the shape of the cornea but can also be due to lens irregularities or unevenness in the retina. Because of these irregularities, different parts of the lens system produce images at different locations. The eye-brain system can compensate for some of these irregularities, but they generally manifest themselves as less distinct vision or sharper images along certain axes. Figure 4 shows a chart used to detect astigmatism. Astigmatism can be at least partially corrected with a spectacle having the opposite irregularity of the eye. If an eyeglass prescription has a cylindrical correction, it is there to correct astigmatism. The normal corrections for short- or farsightedness are spherical corrections, uniform along all axes. Figure 4. This chart can detect astigmatism, unevenness in the focus of the eye. Check each of your eyes separately by looking at the center cross (without spectacles if you wear them). If lines along some axes appear darker or clearer than others, you have an astigmatism. Contact lenses have advantages over glasses beyond their cosmetic aspects. One problem with glasses is that as the eye moves, it is not at a fixed distance from the spectacle lens. Contacts rest on and move with the eye, eliminating this problem. Because contacts cover a significant portion of the cornea, they provide superior peripheral vision compared with eyeglasses. Contacts also correct some corneal astigmatism caused by surface irregularities. The tear layer between the smooth contact and the cornea fills in the irregularities. Since the index of refraction of the tear layer and the cornea are very similar, you now have a regular optical surface in place of an irregular one. If the curvature of a contact lens is not the same as the cornea (as may be necessary with some individuals to obtain a comfortable fit), the tear layer between the contact and cornea acts as a lens. If the tear layer is thinner in the center than at the edges, it has a negative power, for example. Skilled optometrists will adjust the power of the contact to compensate. Laser vision correction has progressed rapidly in the last few years. It is the latest and by far the most successful in a series of procedures that correct vision by reshaping the cornea. As noted at the beginning of this section, the cornea accounts for about two-thirds of the power of the eye. Thus, small adjustments of its curvature have the same effect as putting a lens in front of the eye. To a reasonable approximation, the power of multiple lenses placed close together equals the sum of their powers. For example, a concave spectacle lens (for nearsightedness) having has the same effect on vision as reducing the power of the eye itself by 3.00 D. So to correct the eye for nearsightedness, the cornea is flattened to reduce its power. Similarly, to correct for farsightedness, the curvature of the cornea is enhanced to increase the power of the eye—the same effect as the positive power spectacle lens used for farsightedness. Laser vision correction uses high intensity electromagnetic radiation to ablate (to remove material from the surface) and reshape the corneal surfaces. 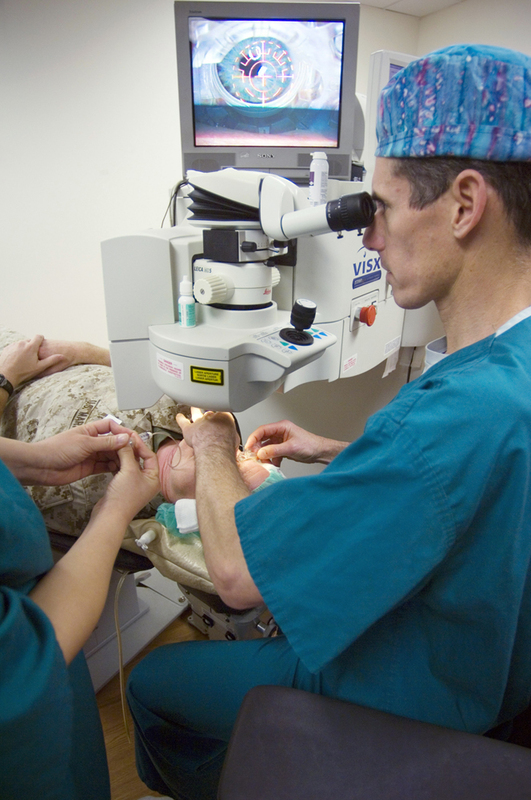 Today, the most commonly used laser vision correction procedure is Laser in situ Keratomileusis (LASIK). The top layer of the cornea is surgically peeled back and the underlying tissue ablated by multiple bursts of finely controlled ultraviolet radiation produced by an excimer laser. Lasers are used because they not only produce well-focused intense light, but they also emit very pure wavelength electromagnetic radiation that can be controlled more accurately than mixed wavelength light. The 193 nm wavelength UV commonly used is extremely and strongly absorbed by corneal tissue, allowing precise evaporation of very thin layers. A computer controlled program applies more bursts, usually at a rate of 10 per second, to the areas that require deeper removal. Typically a spot less than 1 mm in diameter and about 0.3μm0.3μm in thickness is removed by each burst. Nearsightedness, farsightedness, and astigmatism can be corrected with an accuracy that produces normal distant vision in more than 90% of the patients, in many cases right away. The corneal flap is replaced; healing takes place rapidly and is nearly painless. More than 1 million Americans per year undergo LASIK (see Figure 5). Nearsightedness, or myopia, is the inability to see distant objects and is corrected with a diverging lens to reduce power. Farsightedness, or hyperopia, is the inability to see close objects and is corrected with a converging lens to increase power. In myopia and hyperopia, the corrective lenses produce images at a distance that the person can see clearly—the far point and near point, respectively. 1: It has become common to replace the cataract-clouded lens of the eye with an internal lens. This intraocular lens can be chosen so that the person has perfect distant vision. Will the person be able to read without glasses? If the person was nearsighted, is the power of the intraocular lens greater or less than the removed lens? 2: If the cornea is to be reshaped (this can be done surgically or with contact lenses) to correct myopia, should its curvature be made greater or smaller? Explain. Also explain how hyperopia can be corrected. 3: If there is a fixed percent uncertainty in LASIK reshaping of the cornea, why would you expect those people with the greatest correction to have a poorer chance of normal distant vision after the procedure? 4: A person with presbyopia has lost some or all of the ability to accommodate the power of the eye. If such a person’s distant vision is corrected with LASIK, will she still need reading glasses? Explain. 1: What is the far point of a person whose eyes have a relaxed power of 50.5 D? 2: What is the near point of a person whose eyes have an accommodated power of 53.5 D? 3: (a) A laser vision correction reshaping the cornea of a myopic patient reduces the power of his eye by 9.00 D, with a uncertainty in the final correction. What is the range of diopters for spectacle lenses that this person might need after LASIK procedure? (b) Was the person nearsighted or farsighted before the procedure? How do you know? 4: In a LASIK vision correction, the power of a patient’s eye is increased by 3.00 D. Assuming this produces normal close vision, what was the patient’s near point before the procedure? 5: What was the previous far point of a patient who had laser vision correction that reduced the power of her eye by 7.00 D, producing normal distant vision for her? 6: A severely myopic patient has a far point of 5.00 cm. By how many diopters should the power of his eye be reduced in laser vision correction to obtain normal distant vision for him? 7: A student’s eyes, while reading the blackboard, have a power of 51.0 D. How far is the board from his eyes? 8: The power of a physician’s eyes is 53.0 D while examining a patient. How far from her eyes is the feature being examined? 9: A young woman with normal distant vision has a 10.0% ability to accommodate (that is, increase) the power of her eyes. What is the closest object she can see clearly? 10: The far point of a myopic administrator is 50.0 cm. (a) What is the relaxed power of his eyes? (b) If he has the normal 8.00% ability to accommodate, what is the closest object he can see clearly? 11: A very myopic man has a far point of 20.0 cm. What power contact lens (when on the eye) will correct his distant vision? 12: Repeat the previous problem for eyeglasses held 1.50 cm from the eyes. 13: A myopic person sees that her contact lens prescription is . What is her far point? 14: Repeat the previous problem for glasses that are 1.75 cm from the eyes. 15: The contact lens prescription for a mildly farsighted person is 0.750 D, and the person has a near point of 29.0 cm. What is the power of the tear layer between the cornea and the lens if the correction is ideal, taking the tear layer into account? 16: A nearsighted man cannot see objects clearly beyond 20 cm from his eyes. How close must he stand to a mirror in order to see what he is doing when he shaves? 17: A mother sees that her child’s contact lens prescription is 0.750 D. What is the child’s near point? 18: Repeat the previous problem for glasses that are 2.20 cm from the eyes. 19: The contact lens prescription for a nearsighted person is and the person has a far point of 22.5 cm. What is the power of the tear layer between the cornea and the lens if the correction is ideal, taking the tear layer into account? A boy has a near point of 50 cm and a far point of 500 cm. Will a lens correct his far point to infinity? (b) The person was nearsighted because the patient was myopic and the power was reduced. 26.2 Vision Correction by OpenStax is licensed under a Creative Commons Attribution 4.0 International License, except where otherwise noted.